When one of my cats died in January, I began looking for a breeder. I thought about getting another Tonkinese. Using the Internet and the telephone, I quickly found a breeder in nearby West Virginia. FrankLee Cattery, which specializes in Tonkinese, had recently stopped also breeding Bombays and had a couple of adult Bombays needing to be placed. 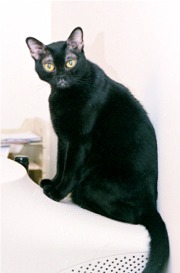 (The jet-black Bombay was created by crossing Burmese, the breed of my recently departed cat, and black American Shorthairs.) I decided to take a trip to Lost Creek, West Virginia, to have a look at the cattery and investigate a breed I had never considered. 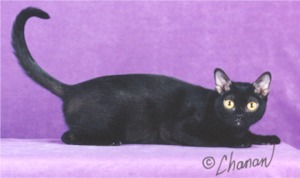 When my Tonkinese died soon after the trip, I decided that I really needed another cat and probably should take a chance on the female Bombay I had seen at FrankLee. (There seemed some wisdom in selecting a cat that didn’t look too much like either of the cats I had just lost.) The Bombay’s name was Evening Light (“Eve”), and I decided to bring her home without spending much time with her. Despite needing some time to adapt to her new environment, Eve has proven to be a happy addition to the household. From the beginning, she and Ezekiel, the other cat in the house, were wary of one another, but curious. No hisses have been heard from either cat, and they have been getting along increasingly well. The process of getting to know a new cat seemed an obvious topic for a poem, but the poem did not come quickly. I first thought of the opening line, “I got a new cat,” but inspiration for the second line was not forthcoming. An opportunity to help a friend at a recording session took me away from work and away from my computer, and while Mike was singing, I was writing “Eve.” I like this poem, but it will likely be revised—and, I hope, improved—over time. I'm still asking myself if my first line should or should not have been split into two lines. Another picture of Eve can be found here.